The executive of the Hungarian Socialist Party (MSZP) unanimously nominated László Botka to lead the party into the 2018 national elections, likely to be held next April. Forty-three year old Mr. Botka, the popular and long-time mayor of Szeged who beat his Fidesz rival by an impressive 22% landslide victory in the 2014 municipal elections, has come across as more agile and no-nonsense in his approach than most of the dithering and feeble politicians in the so-called “democratic opposition.” When Mr. Botka’s name was floated in late 2016 to lead the centre-left’s campaign against Prime Minister Orbán, the mayor had three firm demands: the splintered left and liberal parties must run a single, unified electoral list, the nomination of the strongest and most popular candidate in each single member constituency and they must agree on a new left-wing political platform based on the concept of social justice. “The ball is in their court,” said Mr. Botka of the left-wing’s various parties and clearly indicated that if those three terms are not met, then the opposition needs to look elsewhere for someone to lead their national campaign. László Botka (left) being introduced as MSZP’s candidate for prime minister on Wednesday. Mr. Botka did not entertain any questions from reporters, so it’s difficult to tell whether or not he would agree to choosing the 106 candidates in single-member constituencies through primaries. He did indicate, however, that he will begin negotiations behind closed doors with opposition parties. The question of primaries will certainly come up. In late 2016, MSZP’s leadership committed itself to holding primaries, so scrapping this idea will be a major volte-face for the party. As it stands, the Democratic Coalition (DK) is not especially pleased with the fact that the Socialists went ahead and selected a candidate for prime minister from within their own ranks without any broader consultation. DK was even more rankled by an earlier suggestion from Mr. Botka that former Prime Minister Ferenc Gyurcsány not appear on the ballot in 2018. Speaking to the 168 Óra weekly, Mr. Botka remarked that fully two-thirds of Hungarian voters would never vote for a list on which Mr. Gyurcsány is present. He then added that cooperating with the former prime minister’s party, DK, is unavoidable. “My personal opinion of Ferenc Gyurcsány is better than that of the average Hungarian voter. But this doesn’t matter. Only the numbers count: a stable two-thirds majority of voters would not vote for him,” remarked Mr. Botka. He has also repeatedly emphasized that there is no going back to the pre-2010 world of MSZP-SZDSZ coalitions. It is quite clear that Mr. Botka plans to craft a more markedly left-wing message, geared towards the 40% of the Hungarian population living below the poverty line. “The majority of Hungarians did not consider the previous socialist governments as socially just, nor left-wing, nor socialist,” said Mr. Botka, in a very clear dig at Mr. Gyurcsány, who served as Socialist prime minister for nearly six years, but who advocated for a Blairite Third Way-type approach. “We need to finally appear left-wing,” added Mr. Botka, noting that MSZP has failed to do this, while Fidesz built its 2010 campaign on left-wing rhetoric, yet implemented a system of servitude when it formed government. In June 2016, the MSZP party congress effectively slammed the door on Mr. Botka and his concept of a more markedly left-wing Hungarian Socialist Party. They elected as their chair Gyula Molnár, who was seen as a more centrist politician who had close relations with Ferenc Gyurcsány. According to a report by András Hont in hvg.hu, when Mr. Molnár took over MSZP in June 2016 a DK Member of Parliament turned to his despondent MSZP colleague and said: “Just accept it–it’s going to be Feri!” This was a reference to Ferenc Gyurcsány returning as the inevitable leader of the left. The main parties of the left–MSZP, DK, Együtt and Párbeszéd–have a long, rocky road ahead, and precious little time. But Mr. Botka’s ascension shows what a difference a day makes. …. and the casting fun begins…. It actually looks like Botka is trying hard to avoid the casting disasters of the past. The negotiations between the parties will happen in private…so long as everyone in the room, including the Gyurcsany people, behave like responsible adults. Botka is right on one thing: there is no future for the left with Gyurcsany. He has had almost six years to prove he can expand his base and he has failed. He has not attracted a single new voter and basically relies on his core base of leftover MSZP and SZDSZ voters. They are dying, nobody will come after them. Gyurcsany is yesterday’s news. Just move over already!!! Good concise description of the situation. But why use “the so called “democratic side””. It IS the democratic side, and it should be called so, rather than “left”. Actually, compared to the Orban’s quasi fascist regime even the Jobbik look democratic now. I agree that there is no comparison between Fidesz and the parties of the left-centre opposition (MSZP, DK, Együtt Párbeszéd and LMP) in terms of their commitment to parliamentary democracy and rule of law, in contrast to the governing party’s happy trampling on all of these values. That having been said, being a democrat also means consciously building grassroots organizations, engaging with your base and with potential voters in the field on a daily basis. This is where the opposition is sorely lacking. I have so many examples of this–some personal. The little fascists here are pretty clear on this: why these democratic nonsense of consultations, compromises, choice? All we need is a strong leader of a central power who orders everyone what to do, for 25 years. Gyurcsàny’s standing on the polls has improved and DK has become the third opposition party in six years. Notably, no party has increased its voters in the last 12-18 months. And I don’t know of a recent poll finding 2/3 would not vote for common ballot with GyF. For good or bad (I rate GyF highly) DK is present and a factor in the game. One cannot just “move over” reality, otherwise why not just move over the rotten Fidesz, wouldn’t it be lovely? 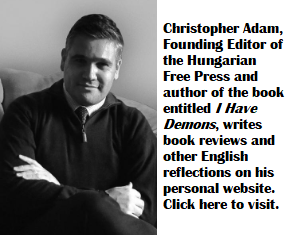 OK Christopher Adams and all the other leftist you want to see another 2006 in Hungary? With all that riots, Molotov cocktails, tank hijacking? Because that’s what will happen in Hungary if those leftists are back in power again. Another 2006 riots is so much fun you know.